As you know, I love running with my kids. And I love it even more that they really enjoy running with me. Katherine is a running mom, like many of us. 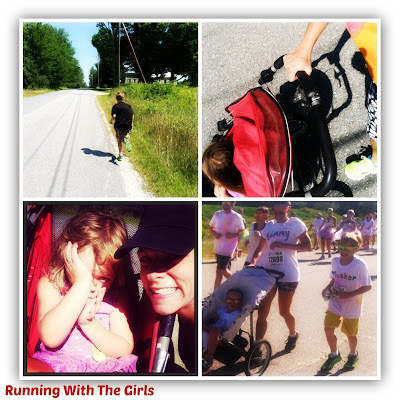 And her daughter joined her for their first run together on July 18, 2012. After recapping the story to her daughter at bedtime, she knew the story had to become a book. And here it is. A beautiful story about a daughter joining her mom on a run for the first time: My Favorite Run. I first came across My Favorite Run when Katherine was raising funds through Kickstarter. She successfully raised the funds to make her inspirational story into a published reality that many parents can share with their little ones. I was one of Katherine's backers and couldn't wait to receive my copy of My Favorite Run in the mail earlier this month. Immediately, Izzy grabbed the book, grabbed my hand, and off we went to the couch for story time. This book immediately jumped to the top of Izzy's favorite book list and mine as well! 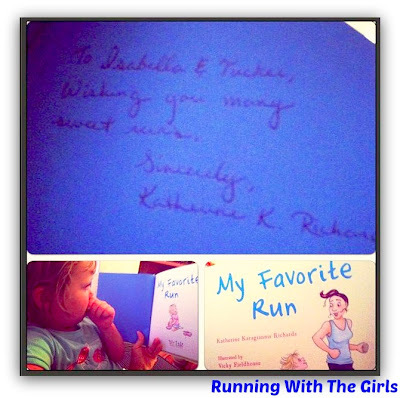 Katherine has graciously offered two Running With The Girls readers their very own copy of My Favorite Run! To enter please comment below to let me know who you would give this book to. - Please visit & like Fit Kids Publishing on Facebook and let Katherine know I sent you. Then come back here and leave a comment so I know you did! - Follow Fit Kids Publishing on twitter and tweet the following "I want to win a copy of My Favorite Run from @fitkidspublish and @runningwtg" - then come back here to comment telling me you did with your tweet link. The giveaway will end on Friday, August 30th at midnight. I will post my winners on Saturday. I will keep it for myself ;) ! My little girl is now 18 months old and love running in the stroller with me and her little brother is due in December. Sounds like the perfect reading material for us! I would keep the book to read to my daycare kids! They are always asking me to time them running? Every day at my house is a road race according to them! Ready,set,go! I would read it to my two daughters, Lydia and Lara. Hoping one day they'll be into running like their Mommy and Daddy! Lydia already loves to run in the jogger with me and go out running with Daddy. It's such a positive, fun, healthy lifestyle choice! I'd give the book to my two kiddos. They are boys, but I want them to run with me when they are old enough too. such a sweet story! LOVE! I want to win it for my daughter! She already runs with me and she is 7 weeks old! My daughter Katie. She is 5 and loves books! I would love to start reading that to her! I also posted on her facebook and Twitter (MaryaliciaV). I will be out of town and away from the computer- so please do email the winner! I want to win this for my 2 daughters and favorite training partners - Finley and Rowan. They are now 6 and 3, and quite the load to push in the double BOB - but now they are fighting for 'when can we get out and run?' during mama's runs. Liked her Facebook page and posted! I can definitely see that happening at your daycare!!! Do you have them do box jumps too? Just think of all those awesome times you'll have with her! I know she'll love it!!!! You will too! A double stroller! That's kickass! Congratulations girl!!! YOU WON! Email me with your shipping address!